Good news, PPTQ grinders! We have data for you. As if the monthly metagame update wasn’t enough for you, this week we have the SCG Syracuse Open to look at, and Jordan will be talking about his PPTQ experience later in the week. Here’s to making informed decisions based on actual data! Dredge won the event, and given the Top 32 decklists I’m not surprised. I had a feeling that Dredge was favored going into Syracuse, and as soon as the Top 8 decks were revealed I became certain that it was. Once the decklists were posted I knew that Dredge would have to fall apart not to take first. I warned everyone back in May to be ready and not lose to Dredge, but the Syracuse field was not prepared well enough to stop Ross Merriam. Most of the decks relied on a couple Relic of Progenitus‘s or Grafdigger’s Cages to fight the recursive menace and that just isn’t good enough. Doing something powerful and explosive yourself is a viable strategy as Nicolas D’ambrose showed in the quarterfinals, but everyone else needs to dedicate the slots or Dredge will just get there. Prepare. Let’s get the boilerplate disclaimer out of the way: I am unpacking a single data point of the wider metagame data. The conclusions I reach can be extrapolated to the wider metagame only weakly as a result. That said, it is useful to investigate whether this point models the wider metagame and to use it track shifts and transitions. We have a lot of information to go through, but not as much as I would like. Star City lists the decks of the Day 2 metagame but not the total from Day 1. Thus we cannot evaluate the Day 2 conversion rate, which is a very strong indicator of actual deck strength. It would also have provided a large enough sample size for me to do some hard statistical analysis. As is I will have to rely on some basic stats and a lot of qualitative analysis. Well, that is quite the list. It appears to be quite the diverse metagame, with 65 players and 32 different decks. It’s much healthier than it was earlier in the year, that much is certain. While hard to evaluate in a vacuum, we can compare these decks to known data and then use that as a basis to compare a smaller subset of data. The first place I’d start is with a comparison to the Top Decks rankings. Jund is on top of both, which I’m never certain represents the strength of the deck or the experience of the pilots. Jund is always a solid choice but it has also been around forever. Modern rewards experience and mastery more than metagaming your deck choice so I always expect long-time Jund pilots to do well, regardless of the wider metagame. Beyond that the next interesting point is that the top five decks all outperformed their rankings, in Jeskai’s case by more than double. Again, barring the Day 1 metagame list, I cannot definitively say whether this was a function of the total population or actual deck strength. That said, it looks like the SCG Tour elite think that you either want to be grinding value for your wins (Jeskai and Jund) or trying to do something unfair (Dredge, Abzan Company’s infinite life combo, arguably Bant Eldrazi). This leads me to think these play styles are what you should prioritize preparing against. The rest of the field underperformed relative to their Top Decks statistics. Burn sits 0.9 percentage points below expectations and only one Affinity deck made the cut, a measly 1.5% compared to its 4.7% overall metagame share. Burn can be excused due to the influx of Abzan Company, but Affinity is an anomaly. Looking through the available decklists there isn’t an abnormal amount of hate present. From this I would speculate that Affinity was underrepresented in Syracuse, especially given that the pilot, Odin Enzmann, got 14th. Alright, this is something to really dig into. There is clear deviation from what we see in the Day 2 results in terms of decks represented. This is where we get the clearest picture of the actual strength of these decks at Syracuse. The first thing to note is Jund. Out of nine players piloting Jund on Day 2, five were represented in the Top 16. That’s a full 55% of Jund pilots who converted to a Top 16 finish, and there’s another copy that appears in the Top 32. That is a statement, and something to discuss further. There are no Jeskai Control decks present. It has gone from 10.8% to 0% population. The highest Jeskai finish was Jim Davis at 25th. This is another important result to investigate. Dredge won the event and put three pilots into the Top 16, a 60% conversion rate. These points are also worth dissecting. I’m not sure that I can draw any meaningful conclusions from the remaining non-Affinity finishes. Yes, they do boast impressive conversion rates. 100% of Temur Control and Mono-Blue Tron players made Top 16 (just). However, I’m inclined to believe that such results speak more about the pilot’s skill than the power of the deck. We’re not seeing these decks have wider metagame success (they’re not even Tier 3 currently), so if you bring such a deck to an Open or GP, I’m inclined to think you’ve mastered the deck. As such these results are unique to the pilots. As I mentioned above, the only Affinity player to Day 2 did make Top 16. In Affinity’s case, which has a much stronger pedigree over the history of Modern, I’m more inclined to conclude from this finish that it’s well positioned. Certainly pilot skill could still be at work here, but the drastically low number of Day 2 Affinity decks just looks odd considering it has been posting consistent Tier 1 results. This leads me to believe Affinity was underrepresented even though the format wasn’t that hostile to it. The deck is hard to pilot and it’s entirely possible that leading up to Syracuse the perception was that the format would be hostile, and Affinity players understandably lost their nerve. Don’t read into the result, keep sideboarding artifact hate! Finally, Burn is Burn, and given the field I’m shocked that Thomas Watson did as well as he did. There were a lot of bad matchups represented in the Day 2 decks so his result is more a reminder to respect Burn than it is a statement on its place in the metagame. Numbers are all well and good but unless we dig into them they don’t tell us anything. I’m going to discuss my interpretations of these results beginning with the lowest and moving up to the winner. The fact that Jeskai had the second highest representation on Day 2 yet didn’t place in the Top 16 is shocking, especially considering its fifth-place position in Tier 1. So why did this happen, and what does it mean? While I can’t say for certain what happened, I can hypothesize given what I know about the deck. One explanation is variance. Jeskai Control relies on grinding out one-for-one trades and pulling ahead with Snapcaster Mage and sometimes Ancestral Vision. If Jeskai doesn’t draw sufficient answers or its answers are not the correct ones for the matchup at hand it will lose. There are a wide variety of decks that attack from a number of angles in the Day 2 data, so it is conceivable that the decks fell when they hit bad matchups or drew poorly. This might have contributed to the problem, but it isn’t the full solution. Variance might be the explanation for a few results but all of them? No. Personally, I blame deck design. Jeskai decks have been increasingly focused on becoming glorified Burn decks with Snapcaster Mage and are skimping on their sweepers. That’s fine against Jund but not against the metagame. Look back at the Day 2 shares for Abzan Company and Dredge. Anger of the Gods is Jeskai’s best game one answer to those decks and Davis played none in his maindeck. Michael Hartman played one. Add in a lack of Supreme Verdict for Bant Eldrazi and I think that the Jeskai decks fell to their overreliance on Lightning Bolt. When your removal cannot keep up with their board development or doesn’t actually remove creatures, you’re sunk without sweepers. Worse, against Dredge one-for-ones just don’t work because the creatures come back. The current Jeskai builds assume that if you Bolt something once, it will stay dead. Dredge specializes in bringing creatures back from the dead. You need to Anger them away for good. Davis did pack two Angers alongside a pair of Rest in Peaces in his sideboard, and that might explain his comparatively high finish. The lesson I take from Jeskai’s disappointing finish is that they should stop relying on one-for-ones to the exclusion of all else and build some forgiveness back into their lists. Putting 55.5% of their pilots in the Top 16 and 66.67% in the Top 32, Jund was clearly very successful in Syracuse. I’m loathe to read too much into this because Jund players will stick to their deck rain or shine and that mastery will carry them even when their deck isn’t favored on paper. This is a lesson in and of itself on the value of practice. However, when we look at what happened in the Top 8 there are some interesting things to note. Discounting the Jund v. Jund quarterfinal, the Jund decks fell to the most unfair deck on their side of the bracket. Chris Andersen fell to Matthew Voltz on RG Valakut and Andrew Boswell lost to Ross Merriam. Jund really doesn’t have the tools to fight RG Valakut decks compared to the RUG versions, and the decks weren’t well prepared to deal with Dredge. The one-for-ones again don’t work and Scavenging Ooze is too slow and easy to overwhelm to be truly effective. The only Jund deck that looks really ready for Dredge is Ryan Hare’s 15th place deck with four Leyline of the Void. I’m not actually a huge fan of Leylines, as they’re only great in your opening hand, and I would prefer a hate card that I can draw into. Still, good on him for recognizing the threat. I think the lesson here is that Jund is Jund. It out-fairs most fair decks but struggles against unfair decks unless it really takes the time to beat them. It certainly can beat any deck and masters can find a way to do it, but when Jund doesn’t get to play its game or that game isn’t the right one then they’re sunk. The real boogeyman of Extended seasons past has returned with a vengeance. In Extended, the old combo-centric version was always a threat but it was beatable as long as you dedicated the sideboard spaces to doing so. It was when you got complacent that it returned. A similar dynamic took place in Legacy over several years. I think we’re seeing this dynamic again at play in Modern. There is not a lot of dedicated graveyard hate in the Top 32, much less the Top 16. Despite the warnings from MTGO results, players either underestimated Dredge or overestimated their ability to fight it. Unless you have a very powerful or fast clock that can ignore Dredge’s board, you need hate to win. Simple as that. What do I mean about fast clocks? Think Infect, which intends to kill before Dredge can develop (when things go better than they did for D’ambrose). Or Affinity, which can go all-in on an unblocked creature to win. Just because you can get there doesn’t mean that it’s a viable plan. Merfolk can win without hate when Dredge has a slow start and you islandwalk past blockers, but that doesn’t happen enough to be a viable plan A. If your plan A is a blitz-like and unfair kill, then you’re fine. Otherwise, pack answers. And I do mean hard answers. As our financier notes today, Grafdigger’s Cage is a pretty soft answer. I get the appeal: it hurts a lot of decks. Combining limited graveyard hate with shutting down Chord of Calling and Collected Company is very powerful. I understand. If it weren’t for Dredge the Cage would definitely be the correct card to run in that hate slot precisely because of its versatility. However, Dredge requires hate that actually empties their graveyard. Why? Players underestimate Dredge’s ability to switch gears and play something similar to fair Magic. Once you shut down Narcomoeba and Prized Amalgam with Cage, they can still keep dredging back Golgari Grave-Troll, playing it and beating face like Rosewater intended. Rather than the broken engine they can use dredgers to simply grind players out and make gigantic threats. They can also do as Merriam did and use Bridge from Below and Greater Gargadon to go ridiculously wide. As long as Dredge has access to its full graveyard, they are dangerous. Cage buys you time, but unless you’re Affinity-fast it won’t be enough. The only deck that has a naturally decent matchup against Dredge in the Top 8 is Infect. This was proven in the quarterfinals. Jund and UW Control don’t have a fast enough clock or a powerful way to go over Dredge to consistently win. Fair deck like them are natural prey for Dredge. Scooze from Jund might work if Dredge is very slow, but they have so many cards that are important to remove that it doesn’t do enough in the early game to actually protect you from Dredge. This left Infect and RG Valakut to stop Dredge. In fairness to D’ambrose, his draws weren’t that great against Merriam. I don’t know what was actually in his hand, but based on what was played I’m not sure he would have beaten any deck. As for Voltz, it is instructive that the game he won was because he got to do his powerful thing and completely ignore Dredge. He could have won more quickly if it weren’t for Collective Brutality, but the point remains that when he got to build his mana and play Prime Time, Dredge was powerless to stop him. When he tried, or was forced, to go more slowly and interact (while lacking powerful graveyard hate) he lost. Hopefully Syracuse was a wake-up call and players start packing their Rest in Peaces, Tormod’s Crypts, and Relic of Progenitus‘s in sufficient quantity to keep Dredge down. Recognize that its strength and adaptability are sufficient enough that weaker hate isn’t enough. Have a plan, have the hate. Beyond that, practice and test your matchups and build some forgiveness into your deck if you can. Having ways to come back from a bad start is no bad thing. Next week will most likely be an IQ report where I am not playing Merfolk (going to salvage something of my intended PPTQ grinder series, dammit). See you in the comments and next week! In the list you posted, the entire Top 16 contains a total of 5 Jund decks. That’s 5/16, not 5/9, so more like a third of the population. Or am I misunderstanding something? He means a third of the population of Day 2 Jund pilots. An interactive deck (Midrange/Control decks) can barely do anything with its mainboard tools against Dredge. Decks that are best positioned against it are the ones which can just ignore what the deck does and that are generally faster. So I guess fair decks are gonna be pushed out a little bit if Dredge is certainly that strong. They’ll be pushed down for a bit, but those are also the decks that can access the sieboard cards they need to overcome Dredge if they want to, which is what usually happened back in Extended. Good article, David. I’m frankly shocked that Jeskai Nahiri players were rocking 0 Angers and 0 graveyard hate when everyone and their dog knew that Dredge was coming. It’s the type of deck that only spikes tournaments when the meta gets complacent, and this win will have people on their guard for it. 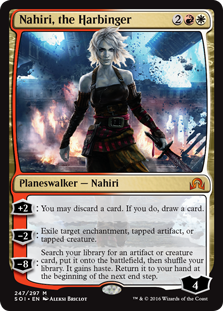 I’m also not the biggest fan of Leyline of the Void, but I can’t decide whether I’d want something like Nihil Spellbomb or Rakdos Charm as Jund. Any thoughts on that? For Jund or Grixis I’d go with Rakdos Charm. Its versatility fits well with Jund’s plan of answering anything (reducing pressure on other sideboard slots is a significant bonus) and the surprise factor is huge compared to a Spellbomb or similar. Coupling 3 Charms with 3-4 Scooze seems like a solid plan for Jund. Other than that, nice article. Your comments on grafdigger’s cage were especially interesting. It reminds me of hurkyl’s recall against affinity in the sense that it needs something else to support it (like a fast clock). That was pretty unclear in retrospect. It’s been revised. I especially liked the comparison to extended. If I’m able to play, I really hope this affects the upcoming GP. Currently quite strong in this matchup. It seams Dredge is a meta game deck. Unlike Jund, where it will always be above 5%, Dredge is not fast enough like affinity to be able to blast/speed thru hate cards. If more people start bringing in dedicated hate cards, dredge goes back to 1-2%, and then people start taking out hate cards and dredge comes back. Plus, it’s a very difficult deck to play at peak efficiency when compared to something like Jund or Burn. ALOT of moving parts and choices to make each turn. If this were Standard, I think it would be tougher but Modern has access to so many cards. Seriously, who would have thought a green deck would have a card like primal command to combat burn and dredge. Odin has been playing Affinity for seemingly forever (the entire 75 is foiled out), so pilot skill definitely played a part in the top 16 finish.